In the movie "A Heart in Winter", there is a scene in which the character, Camile (Emmanuelle Beart) brings in her violin, to be repaired by luthier Stephane (Daniel Auteuil). At the same time, while Stephane is holding a conversation with Camile, he is applying glue and clamping a centre joint. He makes it look as though the act of centring a joint is the easiest thing a luthier could possibly do and certainly does not require his full attention. (other than that scene it is a good movie) Nothing could be further from the truth! Even if everything goes well it will take all of your attention and even then it is a job which will take a full day. You will also likely need the assistance of couple of other people, with defined jobs, to complete the procedure. I know of one person who took 5 days and another who took 4 days in order to complete this 'easy procedure'. I'm into my third day. But, I can see the light at the end of the tunnel, or rather I can see no light from between the two halves of the top plate. The centre joint will and does have to be as perfect as possible with not even a hair width difference between the two boards which make up either the top or back plates. Those two boards will need to be squared then squared perfectly to each other. The least disruption is enough to throw two or three days of work out the window. Simply leaving a door open for 10 minutes may be enough to make the boards out of square. As I've said, I'm close but not close enough to say I've got a good joint that when carved will be an average 2.8 mm thick, be able to with stand up to the combined force of 4 in-tuned strings, and still be flexible enough to vibrate sweetly when the violinist plays a concerto. I've finished installing the ribs. Because my wood is so old and well flamed, I soaked the wood for one hour before bending them into shape. Usually, 10 minutes of soaking is enough time to allow the luthier to bend almost any shape into the wood. The glueing of the top and bottom bouts went a lot smoother compared to one of the C bouts. See previous post photograph. The bottom bout will be made in two pieces. To get as good a joint as possible, I trued up one rib, to act as a 'master' so that I will be able to match the other rib to a standard. When ready to glue into place, I sellotape the two ribs so that they start looking similar to those drawings of seagulls we all drew if they were far away. When glued, the sellotape is rubbed flat and the ribs are clamped unto the end block. I will wait to clamp the corner bouts because if I did it now, I may force a tiny-but both annoying and noticeable gap between the two ribs. The liners are usually made from willow or spruce and I'll be using spruce which will have straight grain, be about 1.5 mm thick (at the top), 2.5 mm wide, and when finished will resemble a knife blade tapering down to 0.1 mm thick. 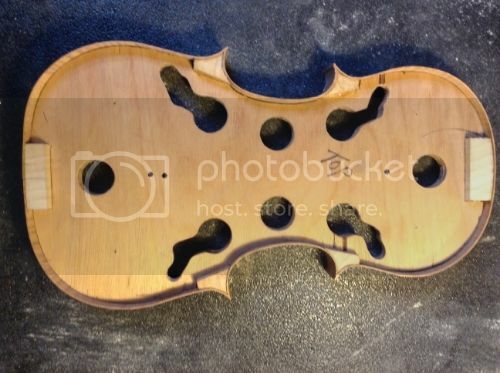 What you end up with is a light weight support for the top and back plates and liners which will not adversely affect the quality or volume of the music being played on the violin. As you can see from the photograph, I'm using very expensive and high tech clamps to hold the liners in place while they are being glued. When dried into place I'll need to sand and level off that side again. Now, I'll be establishing the final shape and size of the four corners of the violin. They need to look like 8 ski slopes with the c bout ribs blending seamlessly into the upper and and lower bout ribs. For the next two weeks I'll be working on the centre joints for both the top and back plates and begin the shaping the general shape of the two plates. I'll also be taking a day off, with everyone else, to take in Europe's largest antique fair, and maybe pick up a good deal on a couple of tools. 1. Why does the scroll look like it does? Artists, architects, and well most people in the 1500 and 1600s looked to nature for their inspiration and guidance with respect to proportions. They also needed a design which was beautiful to look at, compact (so that its various parts would not break or throw the balance off-both visually and weight to length ratio- for the player) and the design could not interfere with tuning or playing the violin. 2. 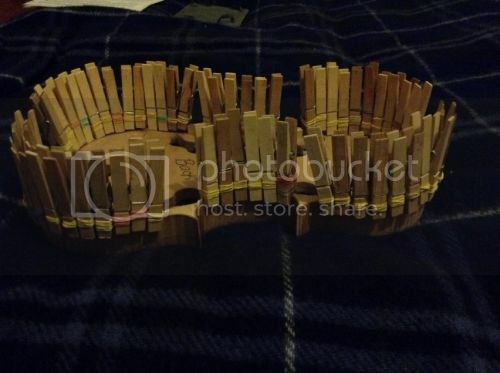 What thickness is the scrapers you had to make to work on the scroll? And how did you know what shape to make the scrapers? I first started with the working on the design. 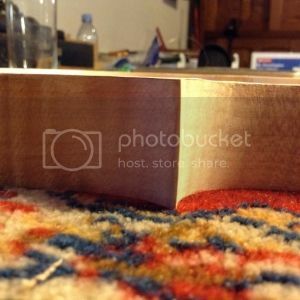 I experimented with cardboard templates until I worked out what I needed. Then I made pexiglass templates and drew those unto an old 1-2 mm thick larger scraper which I was no longer using. Using tin snips and an electric grinder I worked on getting the shapes that would work in the tight curves of the scroll. Scrapers are awkward to handle so I made a leather cover for the edge near the hand. Then moved on from that and made a handle with screws through the scraper .I have a left and right pattern .They look a bit like fish .There is no cramp in the hand when using them. A lighter touch helps to control the cut . The scraper shape is a gentle curve with the end a slightly tighter turn . A grindstone was used to bodge small holes for the screws .